Sometimes, I hear our goats, and I think, "Did you hear that? It sounded like Goats!" And sometimes, I see Ada Lovelace Goat, and Tasha Tudor Goat, and I think, "What? How? Where did these two come from?" 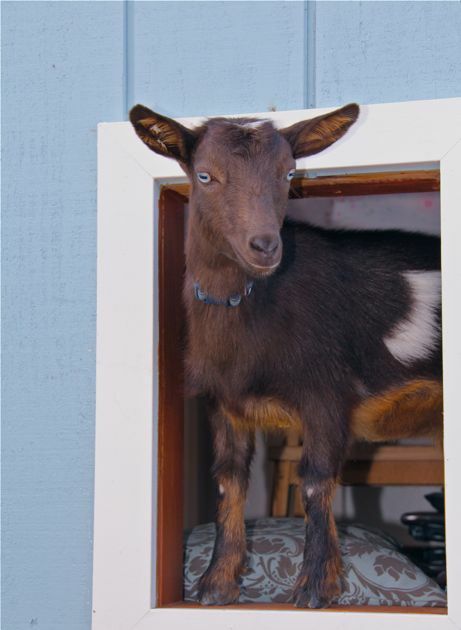 After all, when you bring home bottle-fed cuties, no bigger than a cat, and as fun as puppies, it can be easy to forget they'll grow to be as big and dear as... well, as goats! We love them, those funny, frisky, frolicking two. And even the chickens have made peace with them, mostly. I wasn't sure they'd ever get along... the chickens were appalled at the sight of them, small and cute as they were. But Tasha and Ada don't hold a grudge, and the chicas seem to have accepted their farmyard companions. In fact, they mix-it up on regular basis these days. Tasha and Ada love to go barging into the hen house, in search of leftovers and adventure, and the chicas slip into the goat yard, scratching for treats, rearranging the straw bed. 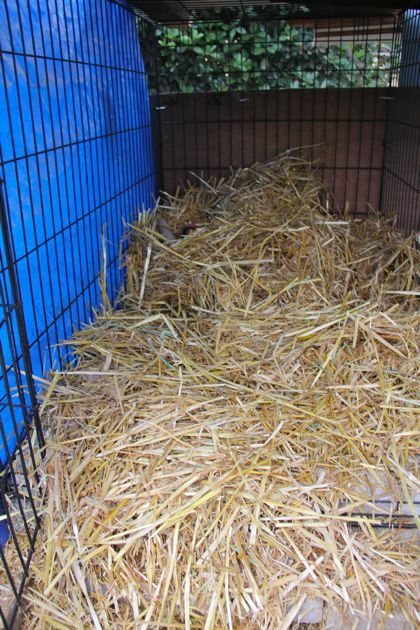 The other day we made some goat yard improvements... more secure, more room, more shelter, and more straw. The goats seemed to approve, at least they didn't mind, since their chow bowl had more, too. But it was the chicas who were really excited and appreciative... Can you find Penny? Look carefully. She's in there. That's no shark fin, poking through the fresh straw. That's Penny's pretty tail. We cannot let this become a habit. 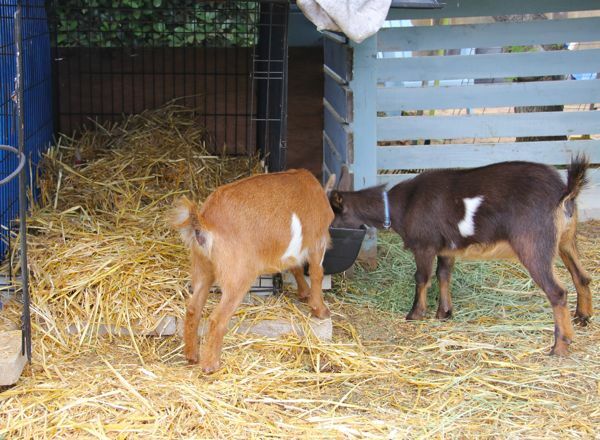 The goats are ladies, but they don't have the refinement and grace of their namesakes. They leap, they bound, they frolic, and fidget, they blunder and barge and burst with boundless bounding. We cannot count on them to step lightly around petite and hidden hens, or to tread on tip-toe around secret stashes of egg-nests. She made her nest high, and snug, and I could hear her practically cooing to herself. So content, so pleased. And as long as these two were preoccupied, she was safe enough. Fortunately, she is not broody, and later, when I saw her dust-bathing beneath the fig tree, I found her pretty little egg, as yet unscrambled. What a lucky Penny. Our Tasha-Goat is named for a woman we admire, Tasha Tudor. Tasha Tudor lived an original, inventive, artful life, and she has inspired happy hours for Maria, and me. Tasha Tudor was born on this day, ninety-seven years ago. When Maria learns about this, I know she is going to be delighted... this calls for tea in the garden, and reading aloud to the goats and bunnies. Thank you, Vicki, at Turkey Feathers,for your lovely Tasha Tudor birthday post. I agree, our imaginations are stirred by all she shared. 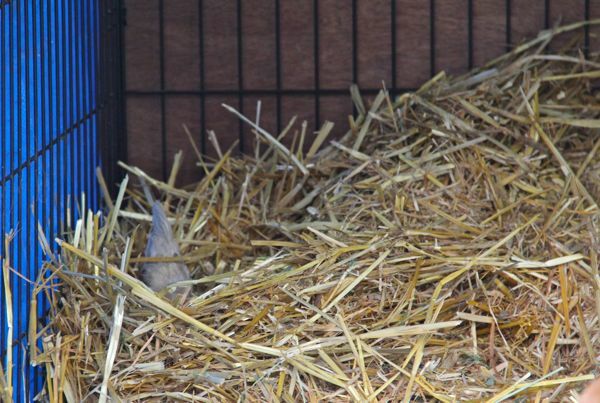 Penny does look very cozy in the straw, I almost feel like joining her. I don't know who Tasha Tudor is...I will have to investigate. Tasha and Ada ARE getting big. I feel similarly sometimes about my own "kids"...like "are those beautiful children, who are wrecking my house as we speak really mine? I made them?!" I have long oogled over Tasha Tudor's life and artwork. My mother recently visited the new museum her children are setting up in VT. Wouldn't that be so fun to see? What I'd really love is a tour of her house. Penny looks so happy in her new nest. haha! 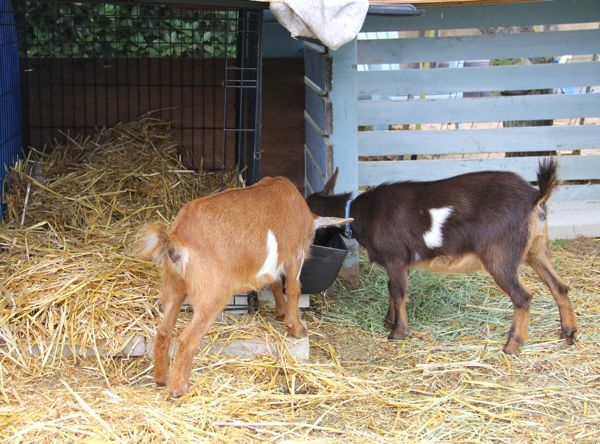 Cute story and pictures of Penny hen and her goat pals. 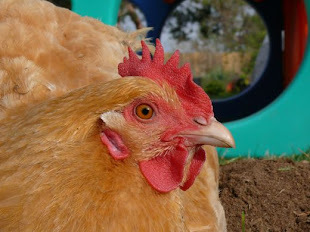 I love chickens, I also had one we called Penny (short for Penelope), she was a great little hen. Thanks for stopping by my blog and for the mention here on yours. I spent a lovely day outside in the garden enjoying the beautiful weather, with teapot close at hand and Tasha on my mind. Take JOY! Aww! 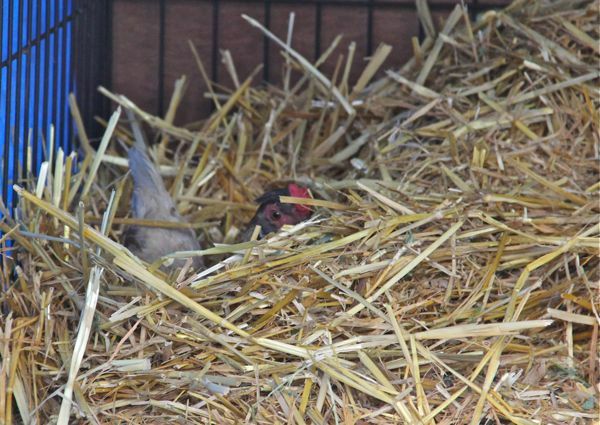 Penny is adorable nestled deep in the straw. That's one happy hen!